Adorn Anew and Bitz ‘N’ Bobz have been separate entities since the concept of adding a collectables store was added to the mix 2 years ago. They have both had different identities, different websites, different eBay Stores and each have been promoted in a different way. Although the original plan to keep them separate was initially a good idea, I believe that they are also 2 halves of the same whole. They both have unique items, and the vast majority of pieces are vintage, retro or preloved. Both are sourced in the same way. Both have a collectable and mainly wearable quality. Keeping the store identities separate has meant that my time has been divided, there has also been a cost element to consider and I believe that by merging the 2 concepts brings a larger more colourful offering with greater choice and a better mix that will have a broader appeal. The more time allowed will mean more time devoted to sourcing and research. Although there will be a Bitz ‘N’ Bobz website, it will eventually link in to the relevant areas within Adorn Anew. Currently the Bitz ‘N’ Bobz eBay Store stock is being moved across to the Adorn Anew Store. From October the Bitz eBay store will close, but there will still be some pieces and discounted items available there ad hoc. 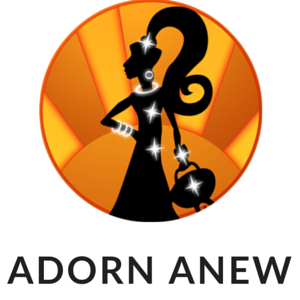 Adorn Anew will be looking at a larger and more varied store from now and in to the future.